I had called Air France 3 times, first of all to verify that bikes travel as a piece of luggage; i.e., free. I was also concerned about the return flight from Vienna, because we would have to throw the boxes away upon arrival in Munich. Despite being told three times by Air France that we did not need to box the bikes, the Air France agent at Washington Dulles Airport insisted we use the boxes that they supplied for free. No problem except for a little extra work. The flights were uneventful; but our bicycles did not make the connection in Paris and would not arrive for another four hours. Meanwhile one of my brothers, his wife, and their bicycles arrived; and we discovered that the other brother's US Airways plane was 4 hours late getting off the ground due to mechanical difficulties. So it was decided that I would use my sister in law's bike and ride with my brother to our hotel, while the ladies would take the suburban train (S-Bahn) to the hotel. The hotel was about a mile and a half from the station in Neufahrn bei Freising, a small town and first stop in the direction of Munich. Fortunately, someone offered them a ride to the hotel when they saw them walking with their luggage. When my second brother's flight finally arrived, the remaining four of us biked to the hotel about 8 miles away on bike paths alongside of the road (most non-autobahn roads in Germany have bike paths along side them). Despite the delay, we were able to get a few hours sleep before going out for dinner at a great Italian restaurant around the corner from the hotel. Meanwhile, our bikes had been delivered to the hotel. Note: maybe it is because I look for the cheapest flights to Europe, but ours always seem to leave the US in the late afternoon and arrive the next morning. I have found that I can get rid of jet lag by getting a few hours sleep upon arrival, getting up at the normal (local) time for supper, and then going to bed again at the normal time. DAY 3: Munich We headed to the main square (Marienplatz) in Munich, a 30 minute ride on the S-bahn. Fortunately, the outbound train appeared first, giving us the opportunity to scout the location of the SAG Wagon. It turned out that there was one both at the front and rear of the train. Marienplatz is anchored on one end by the main shopping area, an approximately 5 block long pedestrian only street (fußgängerzone), and on the other end by an open air food market (Viktualienmarkt) with a beer garden in the center naturally. 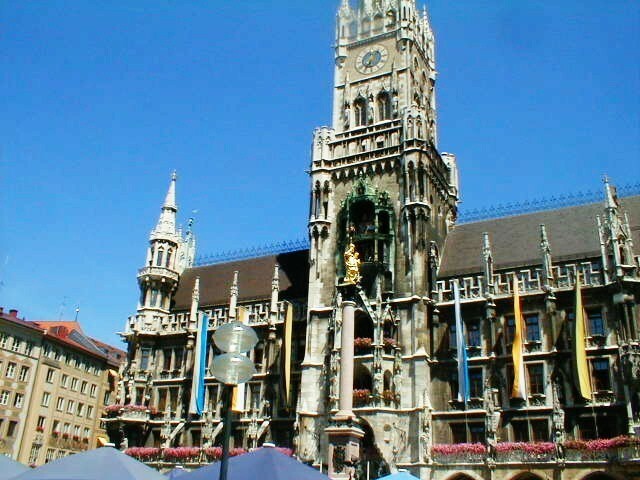 The neo-gothic New City Hal (Neues Rathaus) built in the late 1800's dominates the Marienplatz. 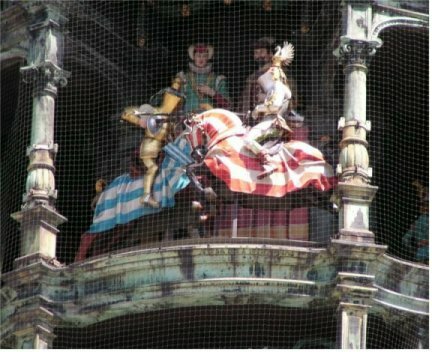 In the center of the Rathaus tower (appearing behind the golden statue of Mary sitting on top of a column in the picture below) is the famous Glockenspiel, a set of mechanical figures which put on a show for tourists several times a day. The show culminates in a Bavarian horseman unseating an Austrian. You can also ride an elevator to the top of the tower to get a roof top view of Munich and the Alps to the south. The knight in Bavarian blue and white is about to unhorse the Austrian in Hapsburg red and white. 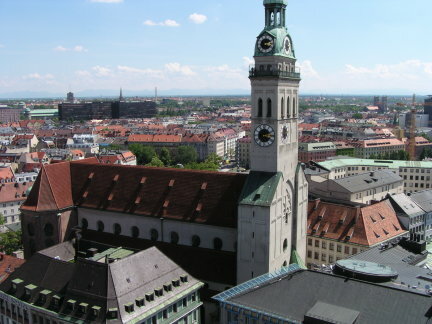 View of Munich from the Rathaus tower, including the Bavarian Alps to the south in the background. By acclimation it was decided that we would have supper at a genuine Munich beer garden. So we picked one of several located in the English Garden, an enormous park in the middle of Munich, and set off on the bike path in that direction. Before we reached it, we came across the Chinese Tower beer garden where a typical Bavarian brass band (not to be confused with an oompah-pah combo) was playing in the tower. Naturally, we couldn't pass up the music and the opportunity for an extra beer before riding on to our destination. 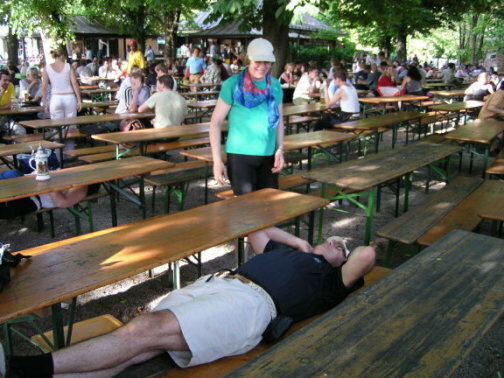 A genuine Munich beer garden is actually a park in which food and, of course, beer is served. It is perfectly acceptable to bring your own picnic food. 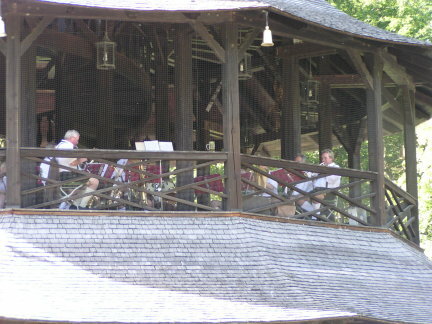 Brass band performing on the second deck of the Chinese Tower (Chinesischerturm) in beer garden of the same name. After every three numbers there was a mysterious halt in the music. Turned out it was a beer break. 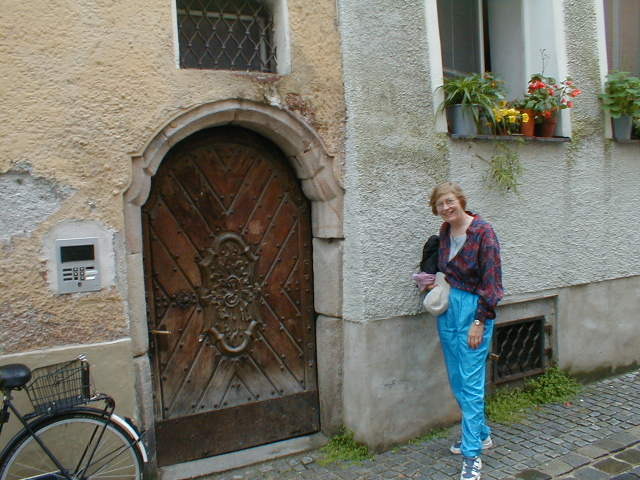 The original plan was to take the train to Passau. However, I discovered that our hotel was only about a mile from the Isar River Bike Path (Isarradweg), which follows the course of the Isar from the Alps south of Munich to the Danube and, as luck would have it, the train line we were planning to take. The group jumped at the opportunity for the bonus miles; so we set off for Moosburg, about 20 miles away. The Isarradweg in this area is flat and passes through a dense bottomland forest along the river. "Use the bridge at your own risk. Not responsible for accidents." 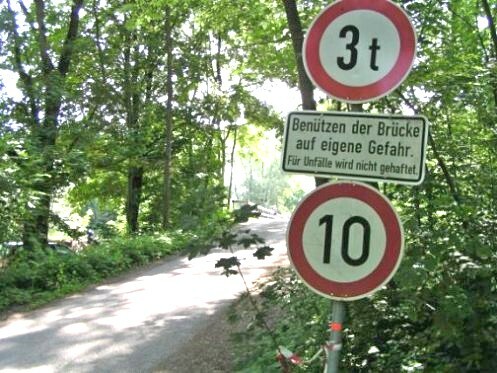 This sign along the Isarradweg between Neufahrn bei Freising and Freising must have been commissioned by the lawyers for the nature preserve through which the bike path passes. It was the feast of Corpus Christi, a holiday in Bavaria and Austria; so we pulled off the trail into Freising, hoping to come across the traditional procession. But it had already finished. 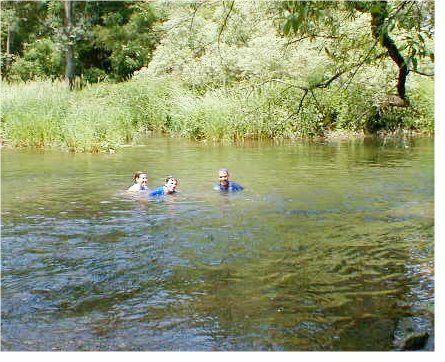 We did have one bit of luck along the trail: a very welcome swimming hole because the temperature was in the low 90's, the hottest I had ever experienced in Europe. Fortunately, about the time we were boarding the train in Moosburg, it started to rain and the one day heat wave was history. Cooling off in water that had been Alpine snow pack only a short while ago. 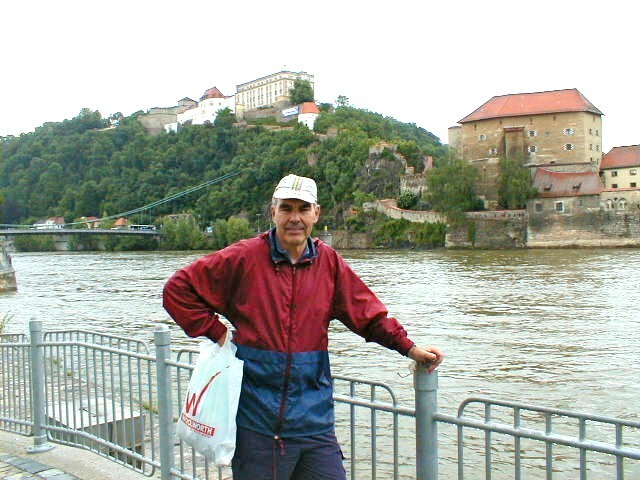 When we arrived in Passau, we discovered that our pension was at the top of a long steep hill and no place to eat nearby. Maybe it was because everyone was cursing my poor planning; but the lady of the house offered to fix supper for us. She asked whether we wanted hot or cold. I said whatever was easiest. She said cold, and fixed a great four course meal with beer and wine of course. The price: 9 Euros (a little over $10). Passau is a medium size baroque city situated at the confluence of the Danube, Inn, and Ilz rivers. In my opinion it is only slightly less impressive than Salzburg, Austria, another famous baroque city. Six years earlier we rode past the city on the opposite side of the Inn without stopping; so I scheduled a layover day here. It is on the Austrian border and the starting point for bike touring along the Austrian Danube. As usual, the inner city was given over to a fußgängerzone. Normally, you can ride bikes in pedestrian zones; but with so many bikes with full panniers ready to start a tour along the Danube, one was required to push them. Instead of biking down the hill to the inner city, and of course back up the hill, we took the bus which stopped only a block from our lodgings. This turned out to be a good decision because of the compactness of the old part of town and the above mention restrictions on bike riding in the pedestrian zone. Feste Oberhaus (upper fortress) to the left and Feste Neiderhaus (lower fortress) to the right as seen from across the Danube near the confluence of the Danube, Inn, and Ilz. 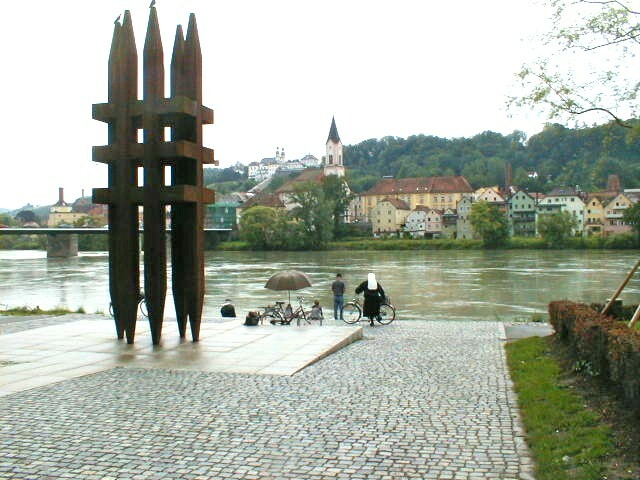 Suburb of Passau as seen from the old city across the Inn River. 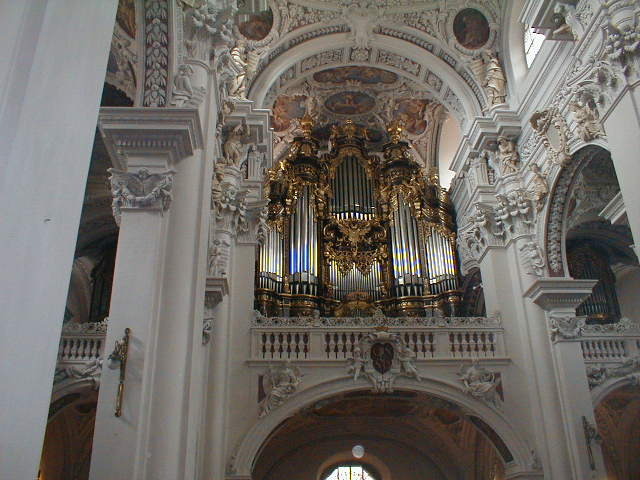 Passau's main claim to fame: its cathedral organ, billed as the largest church organ in the world. A noon concert on a week day drew a standing room only crowd at 3 Euro per head. 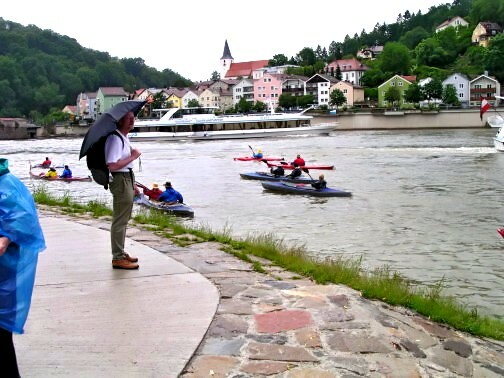 Senior citizen kayak tour as seen from the confluence of the Inn and Danube in Passau. The kayakers had just entered the Danube from the Inn to the right. They then crossed it and turned into the Ilz, a small river to the left of the cruise ship. Our pension was up the hill to the right.